Mac EML file converter helps to export EML to MBOX, PST, EMLX on MAC. After completing the export process, Software will maintains the meta data of all emails like To, CC, BCC, Attachments etc. 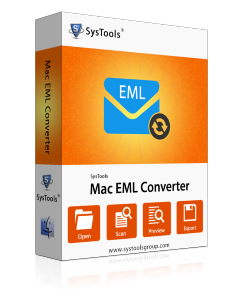 MacWareTools EML to MBOX converter not only converts EML files, It also supports to convert Apple Mail EMLX to MBOX, PST, EML file formats. These exported files can be used on Outlook, Eudora etc email clients. 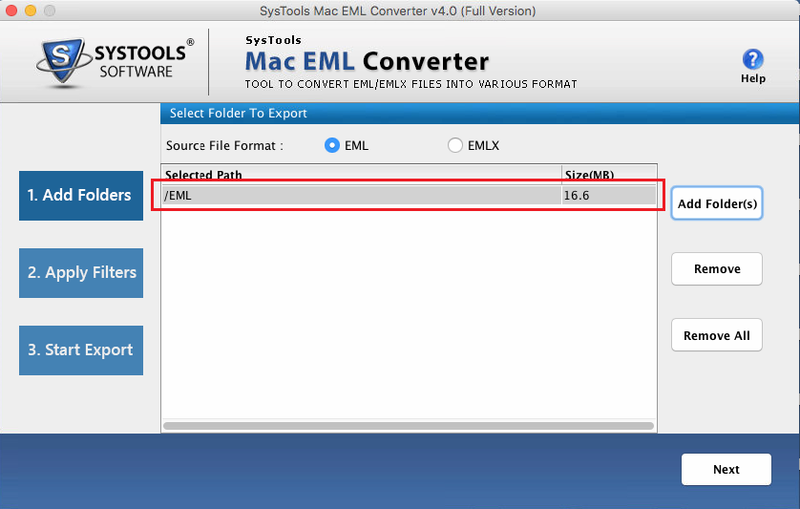 The Mac EML converter not only converts a single EML/EMLX file, It provides you an Add Folder button to add a batch of EML/EMLX files (containing in a folder) and exports them to your desired file format (MBOX, PST, EML, EMLX/EML). 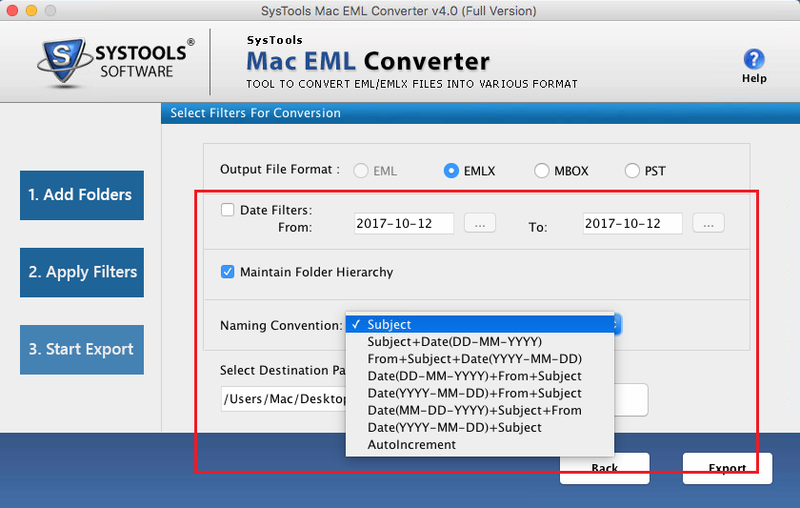 While converting EML to EMLX format, the MacWareTools EML to MBOX converter allow you to save the exported emails with desired naming options available in the software like Subject, AutoIncrement, Subject+Date etc. To convert specific date emails, the Mac EML file converter allow you to export eml files to a specific date range. For this you just need to provide date range from From to To in export panel of the software. The EML to MBOX converter is capable to run on latest MAC OS 10.13 & its below versions 10.12, 10.11, 10.10. Also there is no file size limitation imposed by this Mac EML converter to export EML file to a desired file format. There are a bunch of Mac EML file converter available in the market, but this suits the best to our organization need. As it Converts EML file into different file formats of various email clients. It does what it says. Having such kind of software with excellent customer support in your business, takes you to a different level. We were looking for such kind of one to many utility for the conversion of EML to PST & MBOX to manage our daily base work. Discovering MacWareTools was like a breath of fresh air. My experience with this EML Converter was great. I have tried this on converting batch of EML files of a specific date range and the software accomplished the task very quickly. How can I convert EML to MBOX, PST & EMLX with MAC EML file converter? Can I Convert EML to PST on Mac OS 10.13? 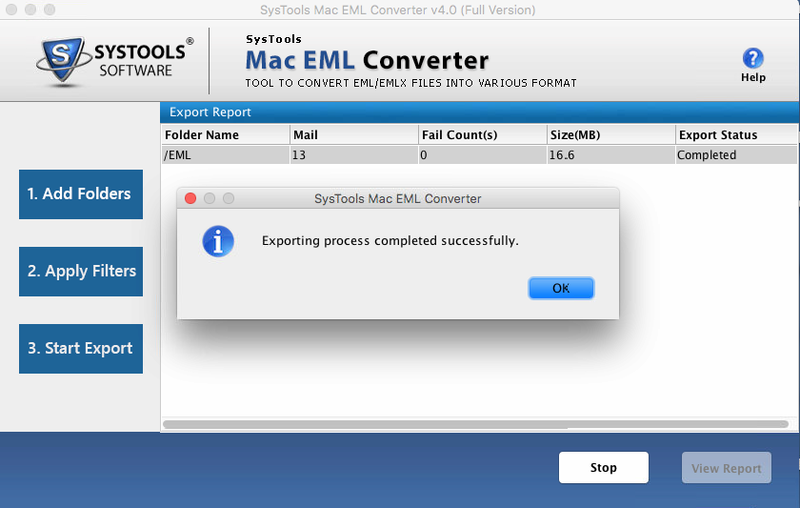 Yes, MAC EML converter supports to run on MAC OS 10.13 & exports EML files to PST, MBOX & EMLX. Is there any additional requirement for any email client installation? No, Software doesn’t need any email client to be installed for the conversion of EML files. Can I convert a batch of EML files using MacWareTools EML converter? Yes, Software easily transfers EML to MBOX & Other file formats in a batch. You just need to Add folder (Containing EML files) to the tool. Does this Software saves emails of specific date range? Yes, the Software allows you to save specific emails with date filter option. Does this Software Converts both EML and EMLX files? Yes, the MAC EML file converter enables you to convert both EML and EMLX files.